In 2014, the National Institutes of Health (NIH), the nation's medical research agency, received $30 billion in taxpayer funds to fulfill its mission to improve the health of the nation. 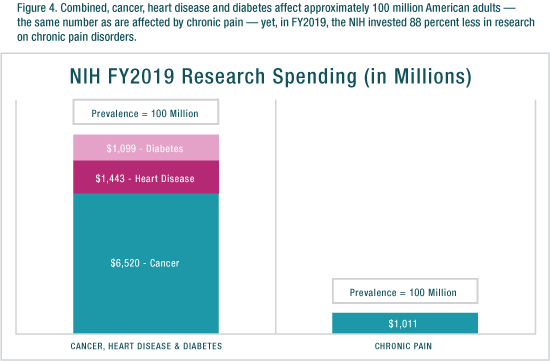 Chronic pain is as prevalent as cancer, heart disease and diabetes combined, yet in 2014, as shown in the figure below, the NIH spent 95% less on chronic pain research than research on these conditions. 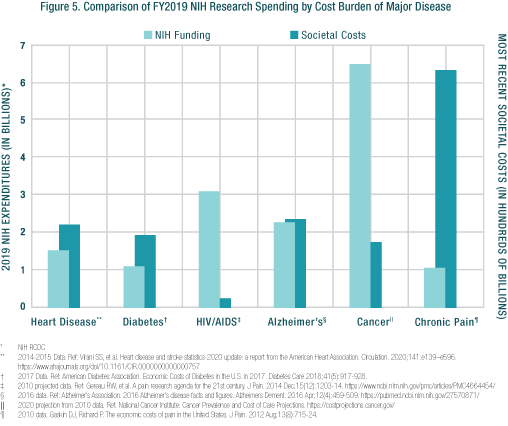 Further, the figure below shows the very low ratio of NIH funding levels to societal costs for chronic pain, compared to other major diseases. 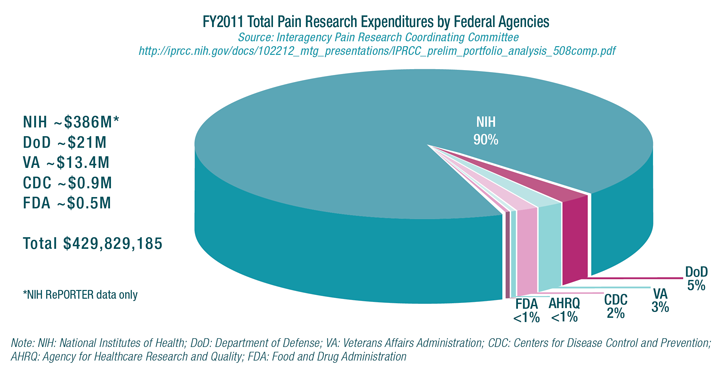 The research investment of other federal agencies is also incommensurate with the significant human and financial impact of chronic pain in both the general and military populations. The figure below summarizes the funding levels of various federal agencies, which represents a total investment equivalent to $0.04 per American adult with chronic pain. Currently, the National Institutes of Health invests $1.06 per affected adult in research on Chronic Overlapping Pain Conditions (COPCs) and other federal research agencies are spending negligible amounts on COPCs research, if any at all.